Johanne Whiley (born 4 July 1965) is an English radio DJ and television presenter. She was the host of the long-running weekday Jo Whiley Show on BBC Radio 1. Whiley was born in Northampton to Martin, an electrician, and Christine, a postmistress. She attended Campion School at Bugbrooke, near Northampton and then studied applied languages at Brighton Polytechnic. She swam competitively for Northamptonshire. In Whiley's final year of her degree, still unsure of what she wanted to do, a conversation with a lecturer led to a job with BBC Radio Sussex on a show called Turn It Up. It allowed anyone to get on the radio and required Whiley to attend shows and interview the musicians. After a year, Whiley left for City University London for a one-year course on radio journalism. After writing many letters, she got a job as a researcher on WPFM, a BBC Radio 4 youth culture and music show. When the presenters Terry Christian and Gary Crowley left, she took over, gaining her first presenting role. She then moved into television, firstly at British Satellite Broadcasting where she produced and presented the indie show, and then at Channel 4 where she worked as a researcher on The Word, with her friend Zoë Ball. Whiley moved on to BBC Radio 1 from September 1993 until March 2011, during the heyday of Britpop with bands such as Blur and Oasis. She hosted a weekday evening show called The Evening Session with Steve Lamacq, which was oriented towards less-mainstream, non-dance music. Whiley presented her own show on Saturday afternoon in late 1995. From 1995 to 1998, Whiley was a regular guest presenter on Top of the Pops, initially co-presenting with fellow DJ Steve Lamacq before flying solo and alternating with Zoë Ball and Jayne Middlemiss. The three women are referred to by the Top of the Pops website as the '90s girls', as between them they presented nearly every show of 1997. However, the only occasion when all three presented together was on Christmas Day 1997. Whiley returned to the show twice between 2005–06 to co-present with lead presenter Fearne Cotton. In July 2009, Whiley published her autobiography, My World in Motion, on CD from Random House Audiobooks. From February 1997, Whiley had a weekday lunchtime show, called The Jo Whiley Show and later The Lunchtime Social. This included elements of the evening show, such as tour dates and occasional live 'sessions' at Maida Vale Studios while working within the restrictions of Radio 1's daytime schedule. When Simon Mayo left Radio 1 for Radio Five Live and BBC Radio 2 in February 2001, Whiley's show was moved to a mid-morning slot. In July 2008, The Jo Whiley Show was fined £75,000 for misleading listeners for an incident involving a member of BBC staff posing as a member of the public taking part in a competition. The BBC claim Whiley herself was unaware of the deception at the time of its broadcast. 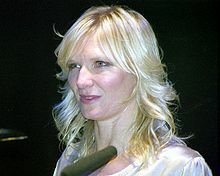 Jo Whiley show ended broadcasting in September 2009 as part of a major shake-up of Radio 1's weekday schedule. The shake-up saw Greg James move to the afternoon slot (then occupied by Edith Bowman) and Fearne Cotton move to Whiley's slot. Her final weekday programme took place on 18 September 2009. Following the Jo Whiley Show, Whiley went on to present a weekend show on Radio 1 between 1pm and 4pm. As with her weekday show, it still featured live performances from visiting artists, as well as three new features: Jo's Road Trip and Top of the Shops and SpellStar. Her last show on Radio 1 was on 27 March 2011. Since August 2009, Whiley has been an occasional stand in presenter for Claudia Winkleman on Radio 2. She was first heard on the network on Friday 21 August and made subsequent appearances on 2 October, 6 November, 27 November and 18 December 2009. In March 2010, it was announced that Whiley and fellow Radio 1 presenter Steve Lamacq would present a one-off Evening Session (the first in 13 years) on Good Friday (2 April) for BBC 6 Music. Presented another Evening Session on 28 January 2011. After being an occasional stand-in presenter on BBC Radio 2, Whiley began presenting In Concert on Thursday evenings in April 2010. On 1 February 2011, it was announced that Whiley would be leaving BBC Radio 1 after 17 years to move to Radio 2, where she would present an evening show from Mondays to Thursdays starting on 4 April 2011, replacing The Radcliffe and Maconie Show. Radcliffe and Maconie would, in turn, move to 6 Music while Whiley's Radio 1 show would be taken over by Huw Stephens. Since 2011, she has co-hosted Radio 2 Live in Hyde Park. In March 2012, the BBC announced that as part of the broadcaster's celebration of the 20th anniversary of Britpop, Whiley and Lamacq would present a week of Evening Sessions on Radio 2 from 7 April. In January 2018 it was announced that Whiley would join daytime on a show with Simon Mayo. This is the first time a female has presented a Radio 2 daytime show in 20 years. On 22 October that year, the station announced that Mayo would be leaving Radio 2 after a backlash against the change, with Whiley moving back to an evening slot. Whiley presents televised coverage of major music festivals, such as the Glastonbury Festival. She also narrated the BBC Three series, Little Angels. In October 2007 she became a judge on the T4 (Channel 4) show Orange unsignedAct which searches for a band trying to get a record deal. Jo has recently begun hosting a music TV show on music channel TMF. From late 1998, Whiley hosted her own music discussion show on Channel 4, called The Jo Whiley Show, which ran for four series until late 2001. On 15 March 2010, Whiley presented an edition of the Panorama documentary strand titled Are the Net Police Coming for You? in which she looked at the Digital Economy Bill, a proposed new law targeting people who download music illegally from the Internet. Whiley married music executive Steve Morton in July 1991 in Northampton. The couple live in Northamptonshire and have four children. In October 2014, Jo Whiley was presented with a BASCA Gold Badge award. Whiley is a celebrity ambassador to Mencap, a UK charity that works to support people with learning difficulties. She hosts the Little Noise Sessions concerts, in aid of the Mencap charity. She is also a supporter of Tommy's – The Baby Charity. Whiley is the Patron of the Cri du Chat Syndrome Support Group. On 19 March 2014, Whiley undertook a challenge for Sport Relief, in which she walked, jogged and ran on a treadmill for 26 hours, with a five-minute rest break each hour. She did this to raise money for the Sport Relief appeal that same week. While completing the challenge she hosted two radio shows. The achievement impressed members of the band Coldplay, who donated £260,000 to Sport Relief. On Whiley's presenting style, Times columnist Caitlin Moran has stated "her on-screen style that seems to inspire the main rage – a decades-long, squirming awkwardness that makes her look as if she's about to corkscrew right off her chair and start drilling into the ground. This awkwardness extends into her conversational rhythm, which is angular – possibly free-jazz in origin." ^ Northampton Chronicle & Echo 4 November 2011, p. 13, "Sweet toothed Jo's Children in Need 'land of cake believe' stunt"
^ a b c d Hughes, Scott (12 May 1997). "CV: Jo Whiley, DJ, Radio 1". The Independent. ^ "Random House". Random House. 25 June 2009. Retrieved 4 November 2011. ^ "BBC fine: The affected shows". BBC News. 30 July 2008. Retrieved 3 August 2008. ^ Plunkett, John (16 July 2009). "Jo Whiley and Edith Bowman lose weekday BBC Radio 1 slots". London: The Guardian. Retrieved 16 July 2009. ^ "Whiley bows out with full house". Pres Association. 18 September 2009. Retrieved 25 September 2009. ^ "Jo Whiley profile at Radio 1 Programmes". BBC. Retrieved 4 November 2011. ^ "Radio 1 – Jo Whiley – Road trip". BBC. 24 February 2007. Retrieved 4 November 2011. ^ "Radio 1: Top of the shops". BBC. 24 February 2007. Retrieved 4 November 2011. ^ Harmsworth, Andrei (15 March 2010). "Whiley and Lamacq go head to head on Good Friday". Metro. Retrieved 15 March 2010. ^ "Jo Whiley to switch to Radio 2". BBC News. BBC. 1 February 2011. Retrieved 16 February 2011. ^ "Lamacq & Whiley reunited on BBC Radio 2". Radio Today. 17 March 2014. Retrieved 17 March 2014. ^ Singh, Anita (9 June 2018). "Radio 2 puts Jo Whiley in the driving seat – but axes its golden oldies" – via www.telegraph.co.uk. ^ "Simon Mayo and Jo Whiley Radio 2 Drivetime show to end". BBC News. 22 October 2018. Retrieved 22 October 2018. ^ O'Neill, Phelim; Catterall, Ali; Skegg, Martin (15 March 2010). "Watch this". London: The Guardian. Retrieved 15 March 2010. ^ "Sir Bob Geldof to be honoured by Gold Badge Awards – M Magazine". 10 September 2014. ^ "Celebrity ambassadors". Mencap. Archived from the original on 27 November 2009. Retrieved 22 October 2009. ^ "Sport Relief: sports therapist from Cambridge helps Radio 2 DJ Jo Whiley through her running challenge". Cambridge News. 21 March 2014. Archived from the original on 22 March 2014. Retrieved 21 March 2014. ^ "Sport Relief: DJ Jo Whiley's 26-hour treadmill triumph". BBC News. BBC. 21 March 2014. Retrieved 21 March 2014. ^ "Go Jo go! Northamptonshire DJ Whiley to start epic Sport Relief challenge tonight". Northampton Chronicle and Echo. 19 March 2014. Retrieved 20 March 2014. ^ "Sport Relief: Stars help to raise more than £51m". BBC News. BBC. 22 March 2014. Retrieved 22 March 2014. ^ Moran, Caitlin (4 July 2009). "Glastonbury on TV". The Times. London. Retrieved 6 May 2010. McNulty, Bernadette (19 October 2006). "Perfect Playlist: Jo Whiley's favourite live tracks". London: The Daily Telegraph. Stonehouse, Cheryl (25 June 2009). "DJ, Mum and Queen of Cool". Daily Express. Retrieved 25 June 2009.